Easter Sunday might have fallen on April 1st this year but there was no fooling with the team charged with creating our Easter Parade Float this year. The truck arrived and was decorated by a team of volunteers from all of the Naas Juvenile Sub Committees and even one or two involved in the Adult sub committees. This year the theme was “Get Naas Active” and with over 80 teams and hundreds of volunteers, Naas GAA is at the heart of keeping Naas Active. 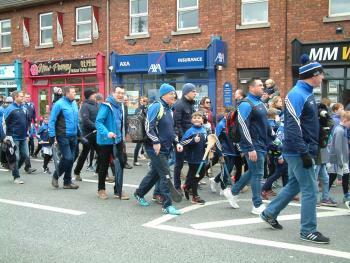 The float departed from the An Post building on the Blessington Road and was proudly lead by Four groups of players from Boys and Girls Football, Hurling and Camogie, carrying some of the many trophies won by the Club in the last year. On board the float we had players representing the Féile na nGael teams from various years. Also, all the boys and girls proudly wearing our Club colours. Finally, we had the mentors and parents who give so much of their time and put in huge effort with all the boys and girls throughout the year. Four groups completed a minute’s “drills and skills” in front of the viewing stand and were commended for their efforts. The club were awarded first prize in the Sports Club Category. The group made their way to the Care of the Aged on the Newbridge Road where the boys and girls all got their goody bags. Our organising committee would like to thank all who helped at planning meetings, getting the float together and to the companies that sponsored us, in helping to make this a memorable occasion for all of our young hurlers and footballers. In particular, to Gillian Murray for organising the goody bags with Aldi, Johnny Langan for organising the signs on the truck with Ted Johnson Ltd, Máirtín Boran from Borans for the truck, Kris the driver and to John Lawlor for the sound. Finally, all of those adults who helped decorate the truck. To Paddy, John, Liam, Paddy, Gillian, Joe, children Saoirse, Ella, Sarah, Shane, Ollie and Philip…and the grown-up children Eoin and Johnny! Finally, thank you to all the people who helped get the news and information on the Easter parade out to our members. Many thanks to our Club PRO Lorraine and Sub Committee PRO’s Marie in Camogie, Stephanie in Ladies Football, Julanne in Boys Football and Eoin in Hurling.